The prospect of the Coalition government being defeated when the Medical Transfer Bill is returned to the House of Representatives on 12 February has been thrown into doubt by the dithering of independent MP Cathy McGowan. The success of the Bill would mean that sick asylum seekers or refugees from Manus and Nauru could be transferred on the recommendation of two treating doctors, removing the veto of the Home Affairs Minister and Border Force. 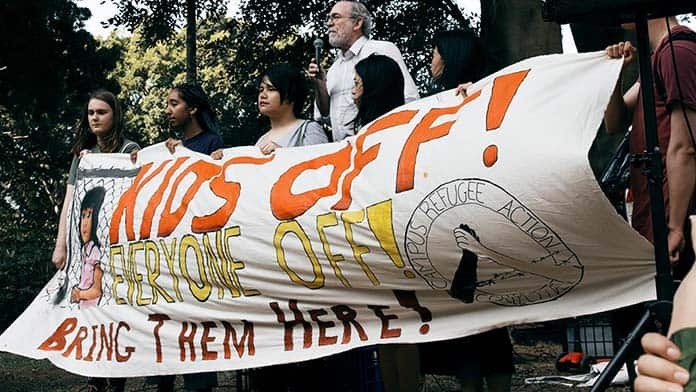 A defeat over refugee policy in the first 2019 sitting of Parliament would be a major blow to the Morrison government so close to the Federal election. The #KidsOff campaign has forced the government to transfer almost all the children and their families off Nauru. Separated fathers and a number of single women and men have also been transferred. Only seven children remain on Nauru; four of them in two families that have been accepted to go to the US. The two other families (with three children between them) have declined to come to Australia so far. The #KidsOff success has been a tremendous boost to the refugee movement. But hundreds are still languishing after more than five years. The mental health crisis on Manus and Nauru gets worse by the day; attempted suicide and self-harm is now a daily occurrence. It is going to take even more determined campaigning to get everyone off and end offshore detention. Labor is committed to the medical transfers, and says it will get everyone off Manus and Nauru. The US deal is almost exhausted after accepting only 467 refugees. The vast majority of recent US resettlement results handed out on Manus and Nauru have been rejections, and there are almost 1000 people still stranded on Manus and Nauru. New Zealand is only offering to take 150 a year. But Labor is just as vulnerable to protest action as Morrison. Unions and a majority of Labor members are against offshore detention. The teacher walk-offs in November showed the potential of the union movement to throw its industrial weight in support of refugees. That potential is going to have to be used against a future Shorten government. Going quiet for Labor won’t free the refugees.